What gathers you to your spiritual Path? What of the impossible do you pray to happen? Did you know that you are Creation’s Infinite possibility? I’m feeling like an old wet coat hanging in a damp place to dry. Dang! Feelings all a jumble and set on harsh edges living under an old moldy coat. Trying to shake it all off. And all that Fall sun and colour calling me out to feel the season. Some days are just like that. Right? I wrote for a prompt last night with my on-line writing group. It was a word pool prompt plus picture. We are invited to pick one word or all the words and let ourselves fall into a writing. I used most of the words. The picture is one I had been sent and I re-posted it out to facebook. Lots of sending going on. 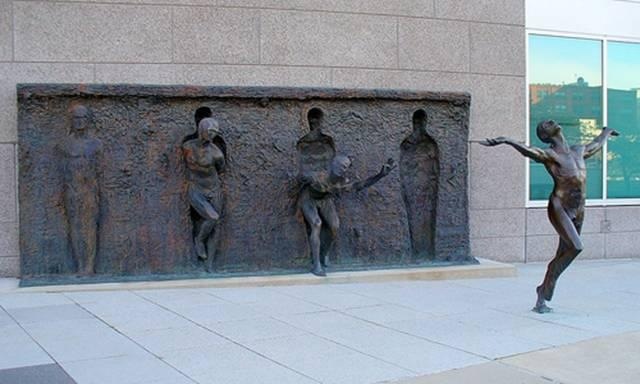 The artist, Zeno Frudakis, is the artist of this sculpture. I decided I would put here the result of my word prompt. There is something about it I liked and wanted to share here. emerge, edgy, elongate, ethereal, underneath, land, portray, leaf, lightly, luxuriate, leap, corduroy, juniper, cheer, chair, lock, woman, peek, side-ways, looking good, black. I am the luxury of what pure joy knows.